Impeccably researched, thought-challenging and leavened by wit, Getting Religion, the highly-anticipated new book from Kenneth L. Woodward, is ideal perfect for readers looking to understand how religion came to be a contentious element in 21st century public life. Here the award-winning author blends memoir (especially of the postwar era) with copious reporting and shrewd historical analysis to tell the story of how American religion, culture and politics influenced each other in the second half of the 20th century. There are few people writing today who could tell this important story with such authority and insight. A scholar as well as one of the nation’s most respected journalists, Woodward served as Newsweek’s religion editor for nearly forty years, reporting from five continents and contributing over 700 articles, including nearly 100 cover stories, on a wide range of social issues, ideas and movements. Beginning with a bold reassessment of the Fifties, Woodward’s narrative weaves through Civil Rights era and the movements that followed in its wake: the anti-Vietnam movement; Liberation theology in Latin America; the rise of Evangelicalism and decline of mainline Protestantism; women’s liberation and Bible; the turn to Asian spirituality; the transformation of the family and emergence of religious cults; and the embrace of righteous politics by both the Republican and Democratic Parties. Along the way, Woodward provides riveting portraits of many of the era’s major figures: preachers like Billy Graham and Jerry Falwell; politicians Mario Cuomo and Hillary Clinton; movement leaders Daniel Berrigan, Abraham Joshua Heschel, and Richard John Neuhaus; influential thinkers ranging from Erik Erikson to Elizabeth Kubler-Ross; feminist theologians Rosemary Reuther and Elizabeth Schussler-Fiorenza; and est impresario Werner Erhardt; plus the author’s long time friend, the Dalai Lama. 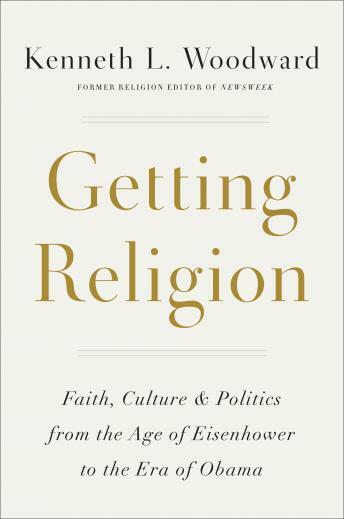 For readers interested in how religion, economics, family life and politics influence each other, Woodward introduces fresh a fresh vocabulary of terms such as “embedded religion,” “movement religion” and “entrepreneurial religion” to illuminate the interweaving of the secular and sacred in American public life. This is one of those rare books that changes the way Americans think about belief, behavior and belonging.